Its been a week since I last posted! We took last week off since my work had a shut down. What did we do? We spent the whole week breaking up concrete in our back patio! Its some back breaking work (for my husband), but I think I have toned my arm muscles nicely from lifting all those concrete pieces and carrying them to our truck in a whiny wheel barrel. 3 trips to the dumps already, probably 5 more to go… *sigh* … the joys of being a house slave. Here is a giveaway! 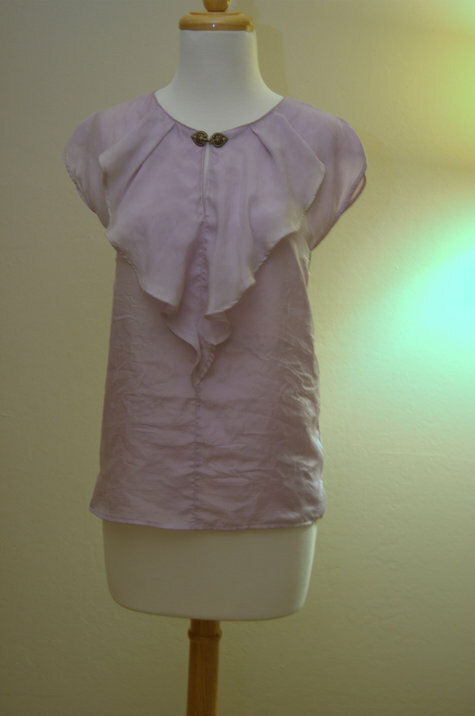 My purple silk blouse! I think I made this last year. I love the silky material, but I didnt really like such a big ruffle in the front, it made me look nice in the photos, but in person its just a little… ridiculous. Regardless I had worn it out a few times, because I loved how it feels! Anyway, I am sure someone out here would like this style. Strict chest size requirement: you must be 32 or smaller! This blouse is a little too small up there for me, another reason I dont like wearing it, the ruffle just bounce around too much and the center slit opens up too much. Okie Dokie, just the usual deal, leave a message here conveying how much you want this, and I will pick a random reader! This entry was posted on Sunday, July 11th, 2010 at 6:10 pm	and posted in giveaways. You can follow any responses to this entry through the RSS 2.0 feed. I love your skirt!!!!! Did you make that too? Where would I find the pattern?? such a great top. would love to win it. I’m talking about a massage, you guys. What were you thinking?! actually, its pretty bad for your hands (carpal tunnel if you use it too much!) D wanted to try using one anyway — this one is a smaller one comparing to the standard size, so not as bad! 1. YOU have inspired me to start my own sewing blog…soon…very soon…. 2. I am also petite. like really. 3. I love a good ruffle. 4. When I start my blog it will be in English AND Japananese and I promise to wear the blouse in my very first post! Teeny girls of the world unite!!!!!! It’s a beautiful blouse. Me please! I love silk and ruffles, plus I have a small chest 🙂 I’m new to your blog and find it inspiring! I’ve been sewing for about a two years now, still a novice. Your blog is great – you make such beautiful clothes! I would love this blouse–just to clarify (in case I don’t win!) did you use a pattern for this top? Because if I don’t get it I’d love to try to make one =)! Thanks! aww thanks! i did use a pattern for this! its from the burda magazine, burda 8/2009 dress#117 🙂 i hope you will make one if you didnt get the random #! I am about your size and would like to win the shirt if I should happen to be so lucky. I like ruffles on shirts! And that one is a good scale that doesn’t overwhelm people our size — at least, I think it looks lovely on you! aww, welcome to my blog! hmm! perhaps you would be willing to trade your skill with a seamstress (you knit them a sweater, they make you a dress). i think i should press that random generator now! Love the color, detailing, and design… very good for masking a small chest, like mine!